Daylight Savings Time begins on Sunday, March 13, 2016. 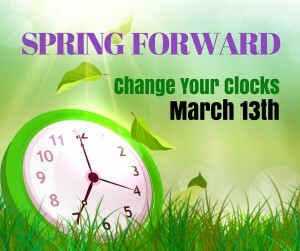 Remember to set your clocks forward 1 hour before you head to bed on Saturday, March 12. Springing forward and falling back may seem simple enough, but daylight saving’s history has actually been quite complex—and misconceptions about it persist today. As you prepare to reset your watches, alarms and microwaves, explore eight facts about daylight saving time that might surprise you. This entry was posted on Tuesday, February 23rd, 2016 at 2:03 pm	and is filed under Events, News & Updates, News from Max. You can follow any responses to this entry through the RSS 2.0 feed. Both comments and pings are currently closed.